Imprisonment as a punishment for crime is not known in Mosaic law. 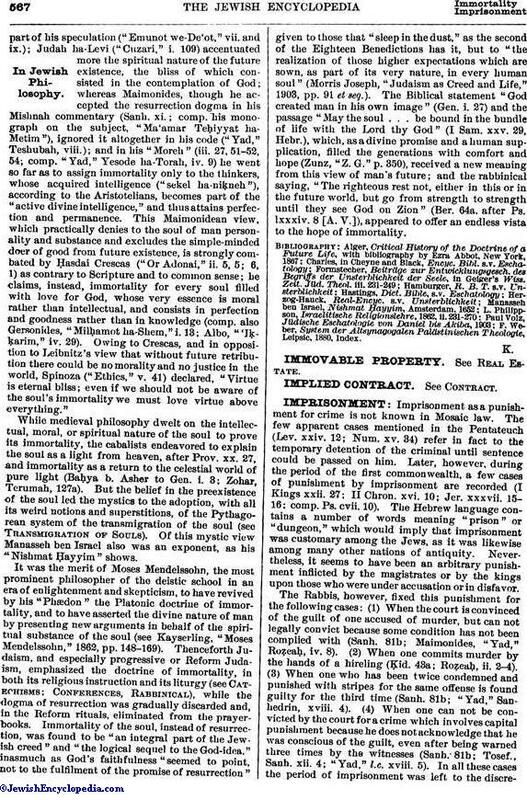 The few apparent cases mentioned in the Pentateuch (Lev. xxiv. 12; Num. xv. 34) refer in fact to the temporary detention of the criminal until sentence could be passed on him. Later, however, during the period of the first commonwealth, a few cases of punishment by imprisonment are recorded (I Kings xxii. 27; II Chron. xvi. 10; Jer. xxxvii. 15-16; comp. Ps. cvii. 10). 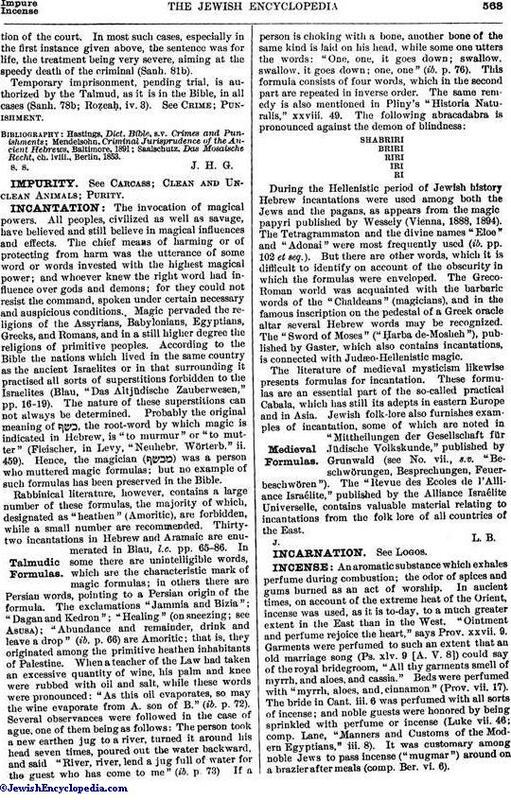 The Hebrew language contains a number of words meaning "prison" or "dungeon," which would imply that imprisonment was customary among the Jews, as it was likewise among many other nations of antiquity. Nevertheless, it seems to have been an arbitrary punishment inflicted by the magistrates or by the kings upon those who were under accusation or in disfavor. The Rabbis, however, fixed this punishment for the following cases: (1) When the court is convinced of the guilt of one accused of murder, but can not legally convict because some condition has not been complied with (Sanh. 81b; Maimonides, "Yad," Roẓeaḥ, iv. 8). (2) When one commits murder by the hands of a hireling (Ḳid. 43a; Roẓeaḥ), ii. 2-4). (3) When one who has been twice condemned and punished with stripes for the same offense is found guilty for the third time (Sanh. 81b; "Yad," Sanhedrin, xviii. 4). (4) When one can not be convicted by the court for a crime which involves capital punishment because he does not acknowledge that he was conscious of the guilt, even after being warned three times by the witnesses (Sanh. 81b; Tosef., Sanh. xii. 4; "Yad," l.c. xviii. 5). In all these cases the period of imprisonment was left to the discretionof the court. In most such cases, especially in the first instance given above, the sentence was for life, the treatment being very severe, aiming at the speedy death of the criminal (Sanh. 81b). Temporary imprisonment, pending trial, is authorized by the Talmud, as it is in the Bible, in all cases (Sanh. 78b; Roẓeaḥ, iv. 3). See Crime; Punishment. Saalschutz, Das Mosaische Recht, ch. lviii., Berlin, 1853.